We were vacationing on Cape Cod and went to a coffee shop in Provincetown. The place was called Wired Puppy which had excellent in-house roasted coffee and a nice assortment of coffee toys such as decent espresso machines and accessories. To top it off, there were a few laptops hooked up to the internet for a bit of surfing and email…and open wifi was free to all. 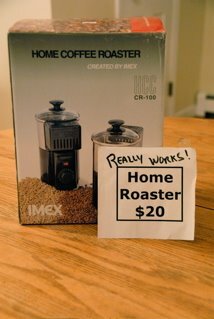 While looking through the store, I saw an IMEX Home Coffee Roaster that was originally marked $200…reduced to $20. I couldn’t believe my eyes. Needless to say, I pulled out a double sawbuck and took the roaster home. I haven’t used it yet, but first impressions are that the machine is pretty well built. It is basically a hot air roaster connected to a timer. The clear top should allow for a good view of how the roast is progressing. There is a screen to keep the chaff from entering the motor, but I’m not convinced that the roasting will be smoke-free as per instructions. More later, but for $20…how can you go wrong? I think my last air popcorn popper I bought for coffee roasting cost more than this.